The U.S. Department of Energy's Critical Materials Institute (CMI) used laser 3D metal printing to optimize a permanent magnet material that may make an economical alternative to the more expensive rare-earth neodymium iron boron (NdFeB) magnets in some applications. The magnet alloy is composed of cerium – a less expensive and more plentiful rare earth – cobalt, iron, and copper. The researchers produced a range of compositions in samples that were printed using a 3D laser metal printer. "This was a known magnet material, but we wanted to revisit it to see if we could find exceptional magnetic properties," said CMI scientist Ryan Ott. "With four elements, there is a vast space of compositions to hunt around in. Using 3D printing greatly accelerates the search process." A range of magnets was printed in two hours instead of producing them via conventional production methods, which can take weeks. The samples with the most promising properties were identified; a second set of samples were then made by conventional casting methods and compared to the originals, which confirmed the findings of the laser-printed samples. 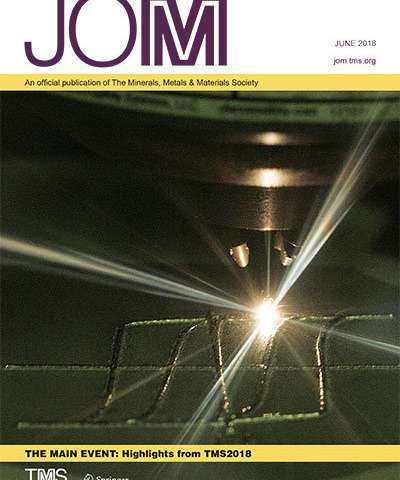 "It is very challenging to use laser printing to identify potential permanent magnet phases for bulk materials because of the need to develop the necessary microstructure," said CMI scientist Ikenna Nlebedim. "But this research shows that additive manufacturing can be used as an effective tool for rapidly and economically identifying promising permanent magnet alloys." The research is discussed in the paper, "Rapid Assessment of the Ce-Co-Fe-Cu system for Permanent Magnetic Applications," co-athoured by F. Meng, R. P. Chaudhary, K. Ghanda, I. C. Nlebedim, A. Palasyuk, E. Simsek, M. J. Kramer, and R. T. Ott; and featured on the June 2018 cover of JOM, The Journal of The Minerals, Metals & Materials Society.